Is a Volatile Economy Good for America? A website for the book provides supplemental data and tables and other material. Every day, in every sector of our economy, a business shuts down while another starts up, jobs are created while others are cut, and workers are hired while others are laid off. This constant flux, or turbulence, is a defining characteristic of our free market system, yet it mostly inspires angst about unemployment, loss of earnings, and the overall competitiveness of corporations. But is this endless cycle of fluctuation really so bad for America? Might something positive be going on in the economy as a result of it? In this penetrating work, three esteemed economists seek to answer these questions by exploring the real impact of volatility on American workers and businesses alike. According to the authors, while any number of events--shifts in consumer demand, changes in technology, mergers and acquisitions, or increased competition--can contribute to economic turbulence, our economy as a whole is, by and large, stronger for it, because these processes of creation and destruction make it more flexible and adaptable. The authors also acknowledge and document the adverse consequences of this turbulence on different groups of workers and firms and discuss the resulting policy challenges. Basing their argument on an up-close look into the dealings and practices of five key industries—financial services, retail food services, trucking, semiconductors, and software—the authors demonstrate the positive effects of turbulence on career paths, employee earnings, and firm performance. 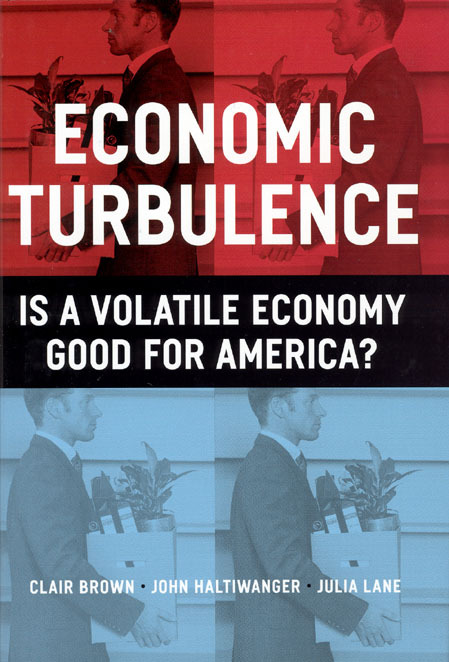 The first substantial attempt to disentangle and make clear the complexities of this phenomenon in the United States, Economic Turbulence will be viewed as a major achievement and the centerpiece of any discussion on the subject for years to come. 2. Economic Turbulence: What, Who, and How Much? "A reasoned and comprehensive deconstruciton of the complexities of economic turbulence."